Sleep problems are common after experiencing a traumatic event, and it’s estimated that 70 percent of adults in the United States have experienced a traumatic event at least once in their life. Up to 20 percent of those people will develop posttraumatic stress disorder (PTSD), and many more will have other lingering effects from the trauma, including disrupted sleep. If a traumatic experience has been affecting your sleep, it’s important to speak to your doctor as soon as possible. Many treatments are available that can help, including psychotherapy, medications and lifestyle changes. Let’s take a closer look at how trauma disrupts sleep and ways you can help yourself to start sleeping better after a traumatic event. Traumatic experiences cause a surge in stress hormones that keep you awake and on-edge, such as adrenaline and epinephrine. If the stress is not resolved, your stress hormone levels remain high, which makes it difficult to relax and sleep. To complicate matters further, stress hormones tend to peak in the afternoon and early evening. Instead of winding down toward the end of the day, your hormones may actually be revving up. And when you have a poor night’s sleep, your body increases its stress hormone production even more to keep you functioning. It can become a vicious cycle as poor sleep only makes the problem worse. A recent survey conducted by Mattress Advisor found that people who were experiencing sleep problems due to traumatic experiences lost, on average, nearly 2 hours of sleep per night. Considering that many of us already get less than the recommended 7-9 hours of sleep per night, losing another 2 hours per night can be devastating to a person’s health. And sleep disruptions can to last for months, and sometimes years, after a traumatic event. 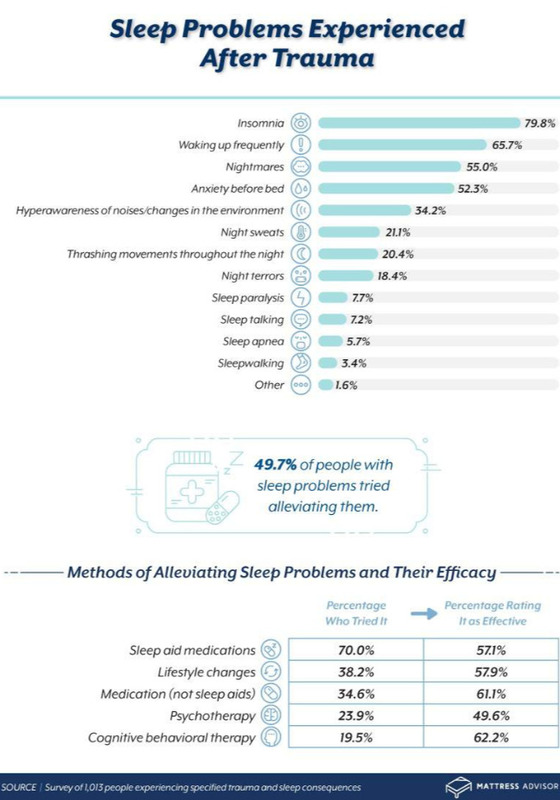 This highlights the importance of taking action to correct sleep problems as soon as they start. The goal of cognitive behavioral therapy is to help you gain greater awareness of your thoughts, feelings and behaviors. By becoming more aware of negative thought patterns and how these are affecting your life, you can start changing these patterns and restoring emotional and physical health. CBT has been found to be very effective in treating PTSD. It has even been shown to help correct biological disturbances in the brain that can occur following trauma. And in Mattress Advisor’s survey, those who tried to alleviate their sleep disturbances after trauma found CBT to be the most helpful of all treatment methods. Respondents felt CBT was even more helpful than medications. Research has shown that meditation helps improve the quality of your sleep and alleviate many sleep problems. One study looked at two groups of adults who were having trouble sleeping. One group took a sleep education class that taught ways to improve sleep habits. The second group was taught a mindfulness meditation program. Those who were taught how to meditate had less insomnia, fatigue and depression than those who learned about improving sleep habits. The researchers felt this was largely due to the fact meditation can trigger your relaxation response and help calm your overactive stress hormones. They recommended meditating for at least 20 minutes a day to support your relaxation response. Consider experimenting with these different meditation techniques to see if they can help you sleep better. EMDR is another proven way to help reduce symptoms caused by traumatic events. In an EMDR session, a trained therapist would ask you to briefly focus on the memory of a traumatic event while moving your eyes from side to side. It may sound strange, but research has shown that this relatively simple process can help trauma survivors transform painful emotions into feelings of empowerment. This can bring an important sense of closure, which supports mental and physical healing following a trauma. Speak to your doctor about whether or not sleep aid medications may help your sleep issues. Medications can be helpful in the short term to get your body back on track, but in general they are not recommended for long-term treatment because chronic use can lead to dependence and withdrawal symptoms. Your doctor will also likely suggest you combine medications with therapy and other non-pharmaceutical treatment options. Is It Natural to Sleep 8 Hours A Night?